Brian Connolly hand over the award to Alan's wife Kathleen Murray. Maybole’s late stalwart Alan Murray has been awarded the Matt Dunnachie award for 2015. 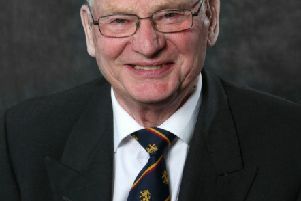 The former councillor passed away in June this year and his influence in the town has been sorely missed. His wife Kathleen accepted the award which is the equivalent of the town’s Citizen of the Year award from Brian Connolly, convenor of the Carrick Sports Club at a ceremony in the Carrick Centre. The Dunnachie family had donated a silver trophy in memory of Matt in 2007 and the award was given posthumously to Alan Murray. Brian Connolly, who is also a councillor for the town said: “This trophy is awarded on an annual basis to an individual or organisation who has contributed to life in the town of Maybole over the years. He briefly outlined Alan’s involvement in the town over many years and commented on his work even when he was ill.
“This year the award goes to Alan Murray,” he continued, “who spent many years involved with various organisations in the town; there are many groups in Maybole and the surrounding villages who have cause to thank him for what he did. Brian then handed over the trophy to Kathleen who said her husband had never looked for such recognition. Bill McCubbin, chair of the committee which selects the recipient of the award also presented Kathleen with a framed certificate. As well as serving as a councillor, Alan helped form Carrick Rugby Club and was at the forefront of the running of the Carrick Centre.